This Program is governed by DET’s Capital Grant Program (CGP) Guidelines 2019, which can be downloaded here click here. Broadly, this requires the BGA to rank project applications from schools by decreasing levels of educational need and financial need, allocate limited funds to the more needy schools and recommend these allocations for Ministerial approval. The CGP provides funding to assist non-government primary and secondary school communities to improve capital infrastructure where they otherwise may not have access to sufficient capital resources. Ensure attention to refurbishment and upgrading of capital infrastructure for existing students, while making provision for needs arising from new demographic and student enrolment trends. Making an application for a Capital Grant that is consistent with a school’s Master Plan is a significant advantage. For further information regarding Master Plan funding click on the tab below. October: BGA Seminar is held and Stage 1 – Notice of Intent applications open. Mid November: Stage 1 – Notice of Intent applications close and schools are invited to proceed to Stage 2. December: Stage 2 – Initial Application open and a briefing is held for all prospective Stage 2 applicants. First Friday in February: Stage 2 – Initial Application close. February – March: Assessment of applications and all applicant schools visited. End of Term 1 (mid April): Schools submit Stage 3 – Financial Information for assessment. May: Schools notified of indicative support and invited to proceed to Stage 4. Briefing for Stage 4 – Final Documentation after which Stage 4 can be prepared and submitted. End of Term 2 (early July): Submission of Stage 4 – Final Documentation closes. July – September: BGA Committee finalises recommendations. By 30th September: Projects recommended to the Minister. December: Schools notified of Ministerial Approval. CLICK HERE for the current list of Milestone dates. own the land or have a lease for the land and/or buildings that has a period to run commensurate with the period in which the capital grant may be required to be repaid if the school no longer provides school education. Investigating the need for schools in a particular area, or schools of particular kinds in particular areas, or buildings or other facilities, or parts of buildings or other facilities, or equipment. Purchasing land, with or without buildings or parts of buildings. Planning for the erection, alteration extension, demolition (including asbestos removal ) or refurbishment of a building or part of a building. developing or preparing land for building or other purposes. Erecting, altering, extending, demolishing or refurbishing a building or other facility (or part of a building or other facility ). Installing or upgrading water, electricity or any other services. Providing equipment, including information technology equipment (as part of a broader capital project unless special circumstances exist). Providing furniture (as part of a broader capital project unless special circumstances exist). Providing library materials or obtaining services and goods for cataloguing a library (or part of a library ) (as part of a broader capital project unless special circumstances exist). Any other expenditure prescribed by the Regulation. Where retrospective approval is sought (generally after a contractual arrangement to commence the project has been entered into). Facilities that are principally for pre-primary education, ie for children below the prescribed state/territory school starting age or where the facility is not in a formal school setting (for example, an Early Learning Centre attached to a school would not be eligible for CGP funding). To apply for the next round of capital funding, a Notice of Intent must be submitted on line by mid-November. The Notice of Intent can only be submitted after the annual BGA Seminar is held in October each year. When you are ready to apply go to Make an Application. This is only available for the application period from mid to late October to mid-November annually. To apply for a Capital Grant for the year after the next calendar year it is recommended that you attend the Annual BGA Seminar held late October each year. The seminar is held on the same day as the Country Area Principals meeting and the Business Managers meeting. Following the seminar applications will open for Stage 1 – Notice of Intent. A Notice of Intent can only be submitted for three (3) weeks following the seminar. This step must be completed by potential applicant schools. Once evaluated by the BGA schools will be invited to proceed to Stage 2 – Initial Application. Go to Make an Application to begin the application process. Prior to lodging an application, applicants must carry out an assessment of the existing and proposed facilities in relation to the Australian Government guidelines. Projects should be carefully planned in terms of both area and cost guidelines. Global Area Standards are tested for both current facilities and once projects are completed. While a school may already have close to 100% of its entitlement based on area standards, it is possible that existing facilities are sub-standard or inadequate. In this case a school may still seek assistance for the refurbishment of such facilities, but in so doing is required to describe accurately the current condition of such facilities. Standard Costs for a range of facilities (e.g. libraries, general learning areas) are set on advice from Quantity Surveyors and indexed each year. An applicants project at Standard Cost is compared to the proposed Project Cost as one method for evaluating whether a design is providing value for money. Click here for Area and Cost Guidelines. Once a grant has been approved by the Minister the BGA will forward to the school “Schedule Two” to the Participation Agreement which confirms the Grant amount, the school contribution, approved project cost and the timing of payment. The school is required to sign and return the document to the BGA. Payments from the BGA to the school cannot commence before January in the first year of the grant. Before a project can commence tenders must be obtained and submitted to the BGA. Please note that no contracts can be signed and no work can be undertaken until the BGA approves the tender or agrees to the school project managing a project. Once the tender is approved by the BGA and before any grant payments can be made a Notification of Contract Signing or Notification of Project Management must be completed and sent to the BGA. The BGA recognises that some schools need to commence their projects as quickly as possible during the summer holidays and will endeavour to process the required approvals as soon as they are submitted. For quick access to all forms for Managing your approved grant CLICK HERE. The Capital Grants Program is governed by the DET Capital Grants Program (CGP) Guidelines at a broad level and the BGA’s policies and guidelines at a more detailed level. Each school’s Approved Authority is required to sign a Participation Agreement to join the BGA. This Agreement sets out the BGA’s and the Approved Authority’s responsibilities, and should be read carefully. Project Commencement – Ministerial approval of a Grant and BGA approval of tender selection must be received before any contracts are signed or works commenced. Right of Repayment – The BGA, on behalf of the Australian Government, can require a Grant to be repaid in full or part if a funded facility is subsequently partly or fully demolished, or sold, or not used, or used for other than its approved purpose. For calculation of possible repayment use CLICK HERE. Grant Recognition – Every project with a Grant of $100,000 or more must have an Opening Ceremony with the Minister (or delegate) performing the opening. All projects must have a plaque affixed acknowledging Australian Government funding. CLICK HERE for full details of the Grant Recognition requirements. Tendering – The Tendering process must be seen to be fair and thorough and to provide the best possible value for a project. Potential or actual conflicts of interest must be resolved with the BGA beforehand. Accountability – Schools are required to have an independent expert authorise all project payments. In traditional arrangements this is the Architect. Schools may use a Project Manager in conjunction with a Quantity Survey. An Architects/Supervisors Statement is required to verify practical completion and an independent Auditor is required to certify total expenditure and receipt of Grant instalments by completing an Accountant’s Certificate. Why have a Master Plan? Schools wanting to apply for a CGP Grant for Round 2020 onward must have an acceptable Master Plan, and the proposed project must be a part of that Master Plan. Please refer to the Procedural Guidelines: Mandatory Master Plans and Master Plan Grants. The BGA is committed to supporting member schools to prepare and maintain Master Plans that give reliable and comprehensive direction to the school’s development and encourages schools to prepare Master Plans with 5 to 10 year horizons. How does a school apply for a Master Plan Grant? Master Plan Grant Applications can be lodged at any time by completing the application form, and are considered by the Committee every six months at its February and August meetings and should reach the BGA by either 15 February or 1 August. Schools submitting a Master Plan Grant Application, require at least one quote to support the expected total cost. Who approves Master Plan Grants? The decisions on whether a school receives a Master Plan Grant, and the size of the Grant, are made by the BGA Committee. Schools with greater financial need will receive priority in allocation of available funds, with a school’s SES score being the primary indicator of financial need. The Committee will be advised by the Executive Officer on a school’s existing Master Plan, its currency, and the supplier(s) chosen by the school. How much is a Master Plan Grant? In deciding the level of a Grant, the Committee will consider its annual budget, and may allocate up to 50% of the expected cost to a maximum of $10,000 per Grant. The Committee has discretion to vary the amount of the grant if it believes there are special circumstances such as the school’s financial need, or the scope of the school’s proposed Master Plan process. The normal Capital Grant Program accountability requirements (i.e. Accountant’s Certificate) apply to Master Plan Grants. The BGA conducts a BGA Seminar for Schools annually in late October. All schools are invited to register for this seminar particluarly if they are considering an application for a grant in the year after the next calendar year. The seminar explains the process for applying and gives school leaders the chance to ask questions regarding the process. Other seminars, workshops or briefing sessions may also be conducted throughout the year. Information about grants made to schools under the Capital Grants Program from Round 2017 onwards can be accessed below. The Project Descriptions, Costs and Grant amounts are those approved by the Minister of Education and Training for that Round. Note that final Project Costs may vary from the amount shown, and final Grant amounts may be less than the amount shown if the final Project Cost is lower. Master Plan Grants are not shown. 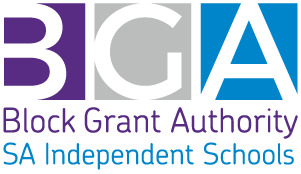 The following are links to grants provided to participants of the SA Independent Schools Block Grant Authority. CLICK HERE for a full list of all Capital Grants for Non-Government Schools as provided by the Australian Government Department of Education and Training. Please email any questions about this information to bga@ais.sa.edu.au . © 2019 BGA. All rights reserved.